Since Nestlé opened its doors in Switzerland in 1866, it has grown to be the largest global food and beverage company with more than 440 factories world-wide. Maintaining transportation of this huge enterprise is a 45,000 strong fleet of vehicles (Nestlé). In 2005, Nestlé calculated that the total cost of road incidents equated to 235,000,000 million Kit Kats a year. This prompted the company to take action and incorporate road safety into their big picture. 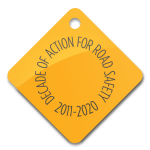 Nestlé made a commitment to improving driver safety and developed a strategy including a safe driving programme 10 point checklist to be rolled out for all Nestlé employees around the world, and the instigation of Nestlé Road Safety Week. Nestlé made a public commitment to continuously improve the management of occupational road safety, and strive toward zero injuries. To achieve this, Nestlé seeks to positively influence road safety behaviour of contractors, customers, suppliers and other stakeholders; collect data about road traffic safety performance and use this to set goals and targets; identify and share lessons from crashes and injuries and implement changes; share information about the company’s road traffic safety management system and road traffic safety performance. Andrew Bradley, Head, Group Risk Services at Nestlé, is the current Global Road Safety Partnership Chair. Nestlé’s global fleet of delivery vehicles includes everything from juggernauts to ice cream vans and even tricycles. The experience of managing such a diverse worldwide transport network has led Nestlé to join the Global Road Safety Partnership. Nestlé is using cutting-edge technology on its long haul transport network to prevent potential road crashes before they happen. The Virtual Risk Management software collects information on a variety of factors including driver licence information, collisions and road side inspections. This not only helps Nestlé to identify higher risk drivers for further support and coaching, but also allows the company to recognise and reward its safest drivers.